Tsuwano is a Shimane Prefecture Tsuwano-cho, and it is called like Kyoto in San-in. The name of a place of Tsuwano seems to originate in "Field where Tsuwabuki grows in abundance". Tsuwano is a town prosperous as the bourg of "Sekisyu-Tsuwano Sanbonmatsu-Castle". The travel was brought together because it had gone to view autumn leaves about "Tsuwano" and "Tyoumonkyou" in the day trip coach tour that the Yomiuri travel had recruited. It is in each tourist facilities. "Sekisyu-Tsuwano Sanbonmatsu-Castle" has by Yamagami of the altitude 367 meters that is called Ipponmatsu, and is a specified historic site in the country. 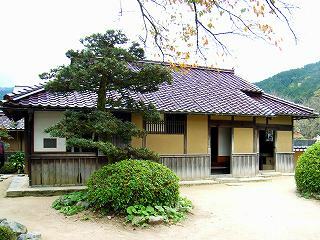 "Yoshimi Yoriyuki" arrived at from Noto to Nishi-Iwami in 1282 (Kamakura Period). 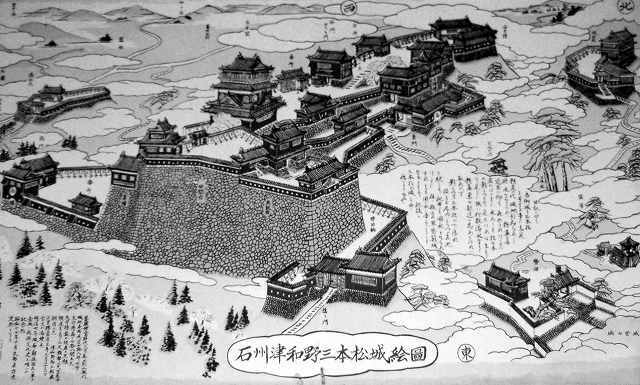 And, it started the construction of the Tsuwano castle. A real mountain castle was completed spending about 30 years in the counterplan at the second generation in 1324. It took a picture to look up near a Mori Ogai old house. Only the stone wall mark in the Tsuwano castle was seen in the top of the mountain. It is called Sanbonmatsu-Castle. Was the Bitchu Matsuyama castle has restored the castle tower, and a mountain castle where here also looked like the Bitchu Matsuyama castle? When the direction from the town in Tsuwano to Shiroyama is seen, the "Taikodani-Inari Shrine" is seen. It is the one that 7 generation in Tsuwano feudal lord imitates and made Fushimi-Inari Taisha Shrine in Kyoto in 1773. It is being counted with "Yuutoku-Inari" in Kyushu, Fushimi-Inari Taisha Shrine in Kinki, "Kasama-Inari" in Kanto, and "Takekoma-Inari" in Tohoku and by one of Japanese 5 large inari-shrine. It is said by those during year who visit a shrine that will exceed one million people. There seemed to be an event of something when we just went, and the flag stood a lot. It is a melody Japanese paper doll made with "Sekisyu" Japanese paper of the outsize in front of traditional craft "Sekisyu" Japanese paper hall. Three kinds (the outsize, largeness, and the inside) had been exhibited. I think that there were about 1m in height outsize. The price was written that one was 2,100 yen. A lot of small drawing out and small articles, etc. made from other paper with colored figuress were put. 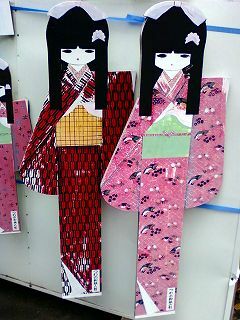 The paper with colored figures of will loveliness makes the kimono colorful. A peculiar paper with colored figures to Japan is valued. 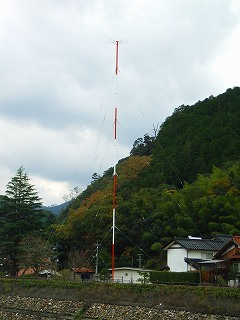 It is a transmission antenna of the medium wave radio broadcasting in the opposite bank in Mori Ogai's old house. There is a capacity ring in the top when often seeing. (It is said a top crown line in the air. )This increases the earth capacitance of the antenna, shows the resonance frequency of the antenna in the antenna and the transmitter with the coil (extension coil) put in the series, and the antenna can be shown to be long by lowering in equivalence. The performance can be prevented from falling so much even if the main body of the antenna is shortened in a word. There is an effect of increasing the high-frequency current near the antenna tip, and moreover, the capacity ring lowers the launch angle of the electric wave, and has the effect of the flight, strengthening far away, weakening (It is said the fading) of the electric wave, and reducing the electric wave. It is a kind of the earth type antenna. The pillar painted on red white at the center is a main body of the antenna. The insulator is put, insulated in some places to prevent the electric wave from getting on pull line, the length of pull line is shortened, and the electric wave is prevented from resonating though a lot of pull line is put and it supports it so that the main body should not fall. The groundline under the antenna that is called an earth pole and a radial earth under the soil is used. The purpose of this is to improve the radiant efficiency of the radio wave. The look with the tradition as the bourg in Tsuwano held in a quiet mountain bosom for about 700 years is a very attractive town. The earthen wall of the Ishimi tile and plaster is towns where the lord town street following both sides is especially excellent in the spectacle in Tsuwano, and thinks of Edo period. A lot of historic sites like the Catholic Church and the county agency mark, etc. have gathered in here, and it is as the most popular in Tsuwano because it is near also the hometown pavilion. The vivid color carp swims in the brook that flows in front of the white wall and the lattice gate, and eyes of the traveler who visits externals where the iris blooms all over can be amused at the early summer. I also feel air that looks like the aesthetic zone in Kurashiki somewhere. The Maria temple of Confusius is a temple of Confusius that builts in "Otome-touge" that is the ground of the martyrdom of the flock of Christ. (construction in 1951) It did not respond to the recommendation of the conversion of the Tsuwano clan, and 36 people died a martyr to the flock of Christ of 153 people that had been sent from Nagasaki by torture in 1868 when the Christianity was strict prohibition. In that case, it is said that Our Lady will have only gotten off the heaven in Japan. The sad appearance is drawn in the stained glass. It is the highest place for a small temple of Confusius that exists on quiet ground to recall feelings that exceed regrettable of the martyr.